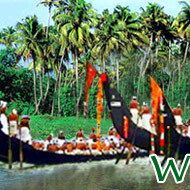 South India wildlife tour covers various wildlife destinations in South India. Come and explore the South Indian wildlife with us! Upon arrival at Bangalore you will be driven to Mysore (125-kms / 3 hrs.). Mysore is one of the most popular cultural and tourist destinations in South India. On reaching Mysore you will go for a sightseeing tour of Mysore including the famous Brindaban gardens, Chamundi Hills, Lalitha Mahal Palace and the Mysore palace. Overnight will be at the hotel in Mysore. After breakfast you will be transferred to the Nagarhole National Park (80 km). Nagarhole National Park (also known as the Rajiv Gandhi National Park) is a part of the Nilgiri Biosphere Reserve, which includes the sanctuaries of Bandipur, Mudumalai and Wynad. Nagarhole National Park provides refuge for a wide range of animals and birds such as Nilgiri langur, Nilgiri tahr, leopard, bison, Asian elephant, wild boar, deer, dhole and porcupine, besides tigers. Enjoy wildlife viewing on your afternoon jeep safari trip. Overnight stay will be at the wildlife lodge. Early in the morning you will be taken for wildlife viewing and bird watching in the Park or a ride on the Kabini River. You can enjoy a jeep ride or an Elephant ride into the Nagarhole jungle in the evening. Overnight stay will be at the wildlife lodge. After breakfast you will be driven to B R Hills (6 hrs.) The B.R Hills Wildlife Sanctuary is a unique blend of resort and wildlife sanctuary. It is home to many species of wild animals. The B R Hills offer a variety of flora and fauna including Gaurs, sambhars, chitals, bears, panthers and elephants. If you happen to be a nature lover than it is the place for you as you can study over 200 species of birds. In addition to this you will have lots of adventure related activities like angling, amateur fishing, coracle boat rides, bird watching, river rafting, trekking, and outdoor camping. In the afternoon you will be taken for trekking in B R Hills for wildlife viewing. Overnight stay will be in tents. There is no end to your wildlife adventure at B R Hills as we take you to yet another day of wildlife viewing and bird watching. Overnight stay will be in tents. In the morning you will be driven to Bandipur National Park (4hr). One of the best managed Tiger reserves; the Bandipur National Park is located at the foothills of the Western Ghats and beckons one and all. It has a sizeable population of elephants, sambar, spotted deer, gaur and flying squirrel, four horned antelope, sloth bear and Nilgiri langur. Among all the prominent animals at the Park, elephants are the dominant one in terms of numbers. Upon your arrival at the resort we will take you for lunch. In the afternoon you will visit the wildlife sanctuary in jeeps. Overnight stay will be at the resort. Enjoy your breakfast and spend rest of the day and evening in wildlife viewing and bird watching. Overnight stay will be at the resort. Early morning, we will drive to Ooty (80 km) from Bandipur National Park. Upon arrival at Ooty you will transfer into resort and spend the rest of the day at leisure. Overnight stay will be in the resort at Ooty. After breakfast you will be driven towards Munnar to reach the Eravikulam National Park. The Eravikulam National Park is well known for the endangered Nilgiri Tahr (Hemitragas hylocres). 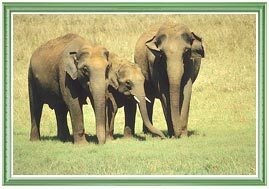 Besides the Nilgiri tahr other important fauna at the Eravikulam National Park are elephant, leopard, malabar civet, tiger, barking deer, sambar, nilgai, langur etc. In the afternoon we will drive to Eravikulam National Park to see the Nilgiri Thar and other wildlife. Overnight stay will be in the resort. In the morning we will take you for a visit to the park for wildlife and bird watching and in the afternoon you will be driven to Periyar (3 hrs.) for yet another wildlife sojourn. One of the world's most fascinating wildlife sanctuaries, the Periyar reserve is home to a diverse wildlife such as Elephant, Tiger, Panther, Wild Dog, Gaur, Sambar, Barking Deer, Wild Boar, Sloth Bear, Malabar Giant Squirrel, Lion-Tailed Macaque, Civet, Leopard, Nilgiri Tahr, Nilgiri Langur and a large number of reptiles and avifauna. Overnight stay will be in the resort. After your breakfast you will spend the day and evening enjoying boat cruise, bird watching and witness the wild elephants frolicking in the lake. Overnight stay will be in the resort. Early morning, we will drive to Kumarakom (5 hr). Upon arrival at Kumarakom in the afternoon you will transfer to resort and spend the rest of the day at leisure. Overnight stay will be in the resort. Situated on the banks of the Vembanand Lake, Kumarakom bird sanctuary is known for its varied avian population. You can spot local varieties such as waterfowls, cuckoos and owls, as well as the migratory Siberian Cranes here at the sanctuary. 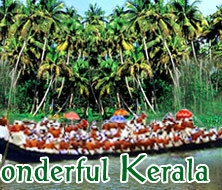 In the morning, enjoy the backwater cruise and in the evening visit the Kumarakoram Bird Sanctuary. Overnight stay will be at the resort. After breakfast you will be driven to Kochi (3 hr). 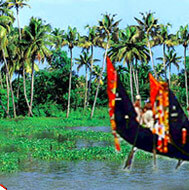 Upon arrival at Kochi/Cochin you will spend the full day sightseeing tour of Kochi. Cochin sightseeing covers Fort Cochin, Church of Saint Francis, Anvin Ayurvedic Panchakarma Clinic, Paradesi Synagogue, Vasco da Gama Square, Mattancherry Palace etc. Later you will be transferred to the airport for onward journey.